I spent 30 years service in the Metropolitan Police during which time I had the honour to be awarded the George Cross. I have been giving talks for the past fifteen years. I am used to giving talks at all types of venues and for all types of events including Cruise Ships, After Dinner Engagements, Charity Events, Schools, Rotary, Probus W.I etc. My Talk usually lasts for some 45 minutes and then time for questions. I am also willing to talk for longer if required and even stay over night for talks the following day. 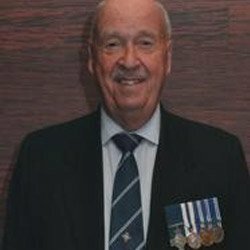 Although many articles have been written on the subject of the George Cross it is very unusual to hear an account from a recipient, as there are very few holder still alive. My talks are by PowerPoint Presentation and I do not read from a script. I am willing to travel anywhere in the UK. Apart from the Talks as shown I have a further eight which I can use. My fee is from £75 depending on location and size of audience plus travelling expenses. I do not charge for local Special Causes. I live in West Sussex and am willing to travel to most parts of the UK but normally Sussex, Surrey, Kent and Hampshire. AN INSIGHT INTO THE BACKGROUND OF POLICING DURING THE 50’S AND 60’S, COMPARING WITH POLICING OF TODAY. THE AMAZING STORY OF HIS ESCAPE FROM DEATH AFTER BEING FIRED UPON FIFTEEN TIMES BY FIVE GUNMEN AND HAVING HIS POLICE VEHICLE TAKEN FROM HIM WITH A GUN AT HIS TEMPLE. HE RECOVERED THE VEHICLE. THIS ACTION RESULTED IN HIM BEING AWARDED THE GEORGE CROSS. 3. VICTORIA CROSS & GEORGE CROSS ASSOCIATION AND AMUSING ROYAL OCCASIONS. HE IS TREASURER OF THE ASSOCIATION, THE MOST PRESTIGIOUS OF ALL ASSOCIATIONS, THEREFORE HE IS ABLE TO DISCUSS THE BACK GROUND OF BOTH AWARDS, TOGETHER WITH AN INSIGHT INTO THE LIVES OF MANY HOLDERS. HE WIL ALSO TELL OF MANY AMUSING MOMENTS WITH THE ROYAL FAMILY. BRINGING TO NOTICE MANY HEROIC AND UNUSUAL DEEDS FROM THE ARCHIVES, IN ORDER THAT THEY ARE NOT FORGOTTEN. ALSO INCLUDING THE LATEST RECIPIENTS FROM THE IRAQ AND AFGHANISTAN WARS. HIGHLIGHTING THE BRAVE ACTS OF A NUMBER OF CHILDREN AND WOMEN WHO RECEIVED THE AWARD, TOGETHER WITH CIVILIANS AND MEMBERS OF THE ARMED FORCES.